Ram Jet 350 - Port fuel injection meets a small-block classic. Restification—blending the best of the old with the best of the new is the hottest trend in hot rodding today. 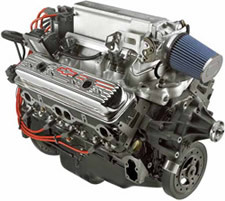 GM Performance Parts has just what you need to put a modern twist on your favorite classic hot rod with our amazing Ram Jet 350 crate engine. GM offered the Ram Jet fuel injection system on a variety of models in the late-1950s through the mid-1960s, but the Ram Jet has never looked as good as it does in the Ram Jet 350 crate engine. The Ram Jet 350 has a styled intake plenum that feeds a state-of-the-art, electronically controlled port fuel injection system. Developed by GM to the same standards as production vehicle systems, the Ram Jet 350 delivers exceptional throttle response and performance. This is made possible by the sophisticated, latest-generation MEFI 4 controller, which has improved electronics and closed loop capability (compared with the previous MEFI 3 system) for great all-around drivability. A venerable 350 cubic inch small-block combination anchors the Ram Jet 350. It is designed for long-lasting durability and pump-gas compatibility, with Vortec cylinder heads, a hydraulic roller camshaft and 9.4:1 compression. 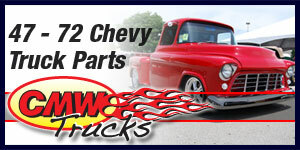 GM Performance Parts delivers the engine with the necessary wiring harness and detailed instructions. It can be installed on any 1976-or-earlier vehicle originally equipped with a carburetor. to externally balanced flexplate for automatic transmission applications. See chart on page 171. Installer to supply 12-volt power source and fuel. See instructions for fuel pump recommendation. Not intended for marine use. IMPORTANT! For a safe, proper and trouble-free engine break-in, the MEFI 4 computer has a "green" mode that controls rpm during the break-in period; from start-up to the end of the first hour is 4000 rpm, the second hour is 4500 rpm and the third hour is 5500 rpm.